The Country Club of Waterbury will, for the tenth time, host Connecticut's amateur stroke play championship. 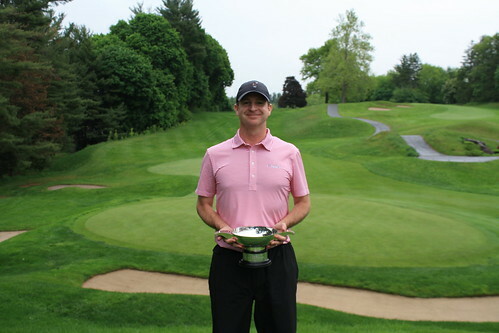 Brian Ahern, Wampanoag CC, held off Rasmey Kong and Andrew Sciarretta to capture his fourth CSGA major championship. Par & Yardage: Country Club of Waterbury will be set up to play at a total of 6,658 yards and a par of 69. Named for Russell C. Palmer, former CSGA Executive Director (1986-1995) and inductee into the Connecticut Golf Hall of Fame (1997), the Palmer Cup is the Connecticut Stroke Play Championship. Mr. Palmer’s numerous accomplishments include establishing the use of GHIN throughout CSGA member clubs and initiating the purchase of the “Connecticut Golf House” which for 30 years has served as the home of the CSGA. In addition to his work with the CSGA, Mr. Palmer was a member of the Royal & Ancient Golf Club of St. Andrews, a past president of the International Association of Golf Administrators, and a past president of the Hartford Golf Club. He was also active in the United States Golf Association where he served as a member of the Museum Committee and as a rules official for several United States Amateurs, Opens and Senior Opens. Entries Close: Wednesday, April 10 at 11:59 p.m.
About the Tournament: 54-hole stroke play championship. All players will play 18 holes on Monday, May 20th. The low 39 players including ties will advance to rounds two and three to be played on Tuesday, May 21st. The lowest 54 hole total will be declared the champion.